The Dutch colonialists in Java Indonesia (the colonial power at the time) planted seedlings of Teak (Tectona Grandis) that originated from Thailand in the year of 1816, making them some of the oldest teak farms in the world. This is well documented. These plantations are now owned by the Indonesian government agency Perum Perhutani, which is responsible for the control of these teak farms allowing the felling of a limited number of trees each year and the reforestation of these farms. Contrary to popular belief, Tectona grandis is a deciduous hardwood tree brought by the Dutch to the dry, hilly terrain of Indonesia during colonial rule. It is not indigenous to Indonesia, but rather a Dutch import which was then planted in the many teak plantations that are still in existence today. Teak is extremely dense-grained and highly resistant to rot, warping, shrinkage and swelling. Its high natural oil content acts as a natural preservative to the wood so it can be left outdoors for decades. How durable is teak? The first outdoor teak garden furniture benches were made of recycled decking from old sailing ships. Many public parks in England are furnished with such teak benches, some of which are nearly a century old. Teak is very smooth to the touch and does not often splinter. It remains very neutral in temperature (no skin burns) compared to metal furniture and has a faint, pleasant aromatic smell. Well made teak garden furniture is typically classic in design with clean architectural lines and timeless style. This is an important attribute for something you could expect to have on your patio for several decades. Our furniture is made from harvested trees grown on plantations following sustainable-yield practices. This process is managed and controlled by PT Perum Perhutani, an Indonesian government agency tasked with preserving this natural resource for generations to come. 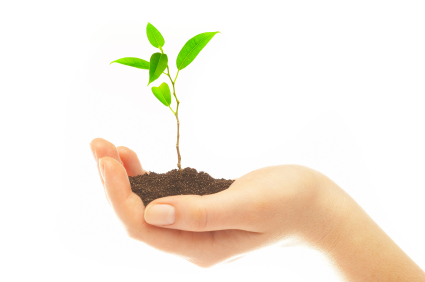 You can find cheaper products crafted from "gray market" trees culled illegally from non-regenerating resources. But we think you should avoid this for obvious reasons. Durability and timeless design make teak garden furniture one of the best values available in home furnishings. Divide the cost of a fine quality teak dining set over the number of years of expected use and you will find our furniture is a very good investment. 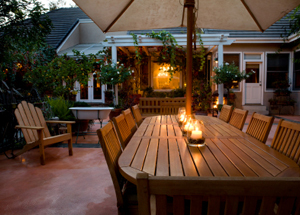 At Wood-Joy, almost all of our outdoor furniture is made from Grade “A” teak or premium teak. Seldom, but on occasion we sell a lessor grade teak, such as B-C Grade teak. We always note this clearly on our product pages and is noted as economy grade. Our Grade A components are visually matched to a high degree of color uniformity. There are minimal "live" knots and no dead knots or sap lines. Natural teak if left outdoors will gradually weather to a silver grey color. This would probably take about 9-18 months depending on the amount of sun and rain it has been subjected to. Small cracks (known as checking) and very slight warping may appear. This is a characteristic of all hardwood timbers and will not affect the strength or durability of the furniture.This is due to changes in the seasons and the wood releasing or drawing moisture from the atmosphere. Checking and possible slight warping is not to be considered as a defect. Semi-machine made furniture is produced using power tools in a factory. Cuts and bores are more precise, although pieces are ultimately fitted by hand. A skilled, experienced worker with proper training and resources can produce very fine semi-machine products with a high degree of uniformity. 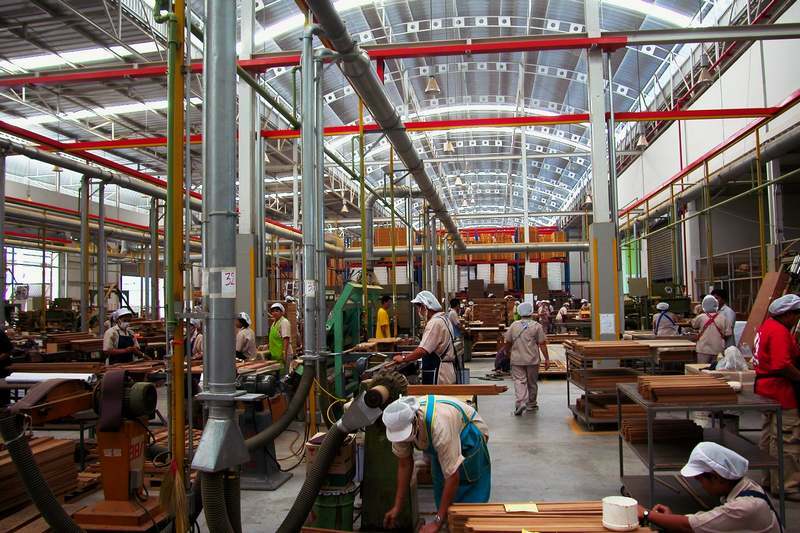 At Wood-Joy, most of our teak products are fully machine made, including our chairs and other high volume pieces. We also selectively use semi-machine manufacturing where our quality standards can be met at a more competitive cost (which we pass along to our customers).